Editor's Note: For those unfamiliar with the Cinema Park mural, click here and here. The last two "Special Features," a film about the development of Kew Gardens, was really well done. Editor's Note: Local historian. Ron Marzlock, has a short article about Crystal Lake in the current Queens Courier newspaper accompanied by an old photograph of it. I just discovered your web site, and it is a pleasant surprise. Many kids from Kew Gardens went to PS 90. I attended 1954-1960 (I lived in the Buckingham on Lefferts). I greatly regret destroying my Kindergarten class photo from Miss Herring's class of 9/54-6/55. If anyone from that class still has the photo, I would love a copy (see my email address). I did not qualify for the school bus after second grade, as the Buckingham was half a block too "close" to PS 90. I had to take 2 public buses to school when I was only 8 years old. Once, I was almost dragged along by the bus. I visited PS 90 recently after 49 years, and they told me that today 7 year-olds have to take public buses! My name is Michael Claxton, and though I was never a resident of Kew Gardens, I am writing a book about Dell O'Dell (1902-1962), the female magician who performed at PS 99 in the early 40s. She often performed with her husband, the juggler Charles Carrer (1898-1971). I am interested in hearing from anyone who remembers her and is willing to share those memories (no matter how brief). Thank you very much for your time. I am attaching two photos of Dell O'Dell, which you may post to the site if you like. My email address is mclaxto1@harding.edu, and I would like for it to be published. I found this site in a Google Search. ID's for PS 99 1961 class 3-1 2nd row from back, 2nd from left also - 1958 Kindergarten 1 PM back row, 2nd from left. I lived in Kew Gardens from 1947-1968, and graduated PS 99 in 1958. I noticed a picture of Brownie Troop 4-76 from 1956, and I can identify almost all the girls in that picture (since I am one of them!). Here goes... .
Middle Row: Emily Prager (I think), Linda Zwahlen (passed away last year), ?, ? I'd love to hear from any of those girls if they are out there. Unfortunately, I have not seen Robert Lieberman's documentary entitled "Last Stop Kew Gardens", but have just read a very concise review of it by Sewell Chan in today's (4/23) New York Times. While I never had the good fortune to meet Mr. Lieberman during the years of my youth in Kew Gardens (I believe he was a year or two behind me in public school), I did become friends with many of the other children of Jewish refugees from Central Europe that he alludes to, and two in particular that were apparently interviewed for the film. I was all of nine years old when I met a new admission to my class at '99' by the name of Evelyn Springer who was as pretty as a picture, and with whom I immediately developed a crush. I would offer to carry her books home after school so I could enjoy her company while we munched on milk and cookies that her very gracious mother always had ready for us. Oh, did I mention her pesky little brother Jerry (the future Mayor of Cincinnati and famed talk show host) that I think Evelyn used to throw a nickel at to disappear while she was 'entertaining'? Then, there was my good friend Danny Ein who was later to become a nationally known Allergist/Immunologist in Washington, DC - Danny and I lived on the same block and we palled out together - I think I spent more time in his house then in my own thanks to the very cordial reception I always received from his parents. And that cordiality that radiated from the parents of both Evelyn and Danny is what impressed me the most, and is the reason for this writing. These were people who carried with them the painful and horrific memories of their experiences under tyrannous rule in Europe and yet hid them in such a way as to make the new world that they escaped to free of those nightmares for their children. They are to be applauded! Editor's Note: Al has also told me something I did not realize. At five minutes and six seconds past 4:00 AM on this coming July 8th, the time and date will be 04:05:06 07/08/09 - something that will never happen again. I plan to be awake at that time so I can say I lived through it. 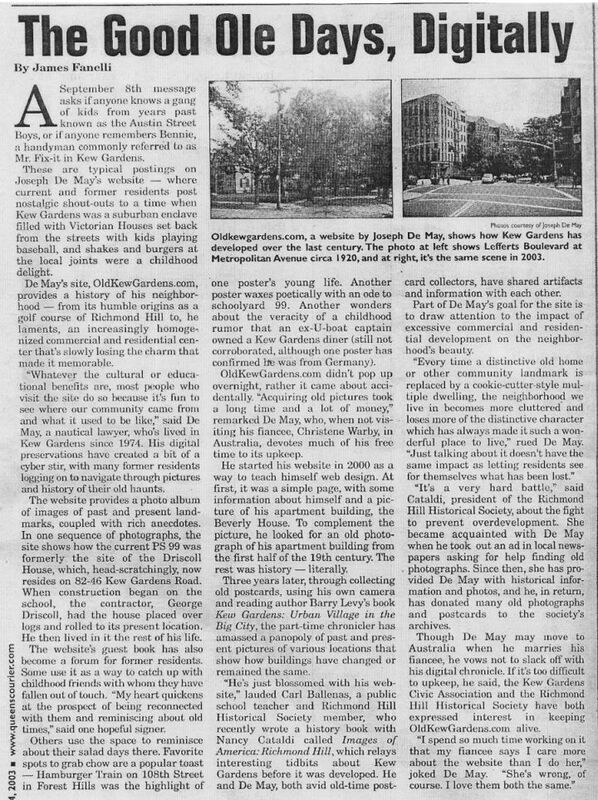 Editor's Note: In case you missed it, the link below is to the April 22, 2009 New York Times article about Robert Lieberman's film and about growing up Jewish in Kew Gardens. Click here to read the Times article. I came across the article in todays NY Times about the film last stop in Kew Gardens , for me it was first stop kew gardens, as i was born in the old kew gardens hospital, that as many of you surely know was originally a hotel. Although i did not grow up in kew gardens it would have been the place where i most probably would have fit in. Like those who are portrayed and written about in todays article, like them my parents were holocaust survivors. I too was very concious of my parents heavy european accents and because my father could not speak Czech they often conversed in German , which made me feel very uncomfortable and when riding the subway with my parents i would distance myself from them. Something that has always made me feel guilty , now i know that many others had similar feelings. As i became an independent young adult i chose to live in Kew Gardens on Talbot street in one of those massively constructed apartment buildings, where the walls were so thick that no matter how loud i played my music my neighbors remained undisturbed. I really loved kew gardens and the wonderful houses and the feel of the neighborhood.I have many fond memories including those of the wonderful pizzeria, Dani's where i would often eat. Now as i turn 50 im living where my mothers holocaust ordeal began i very much regret not having learned german back in those days but as i have told my friends what was i going to do with german in NYC.? So thank you for the website i plan to discover what i dont know about Kew Gardens , a special place. Editor's Note: There is now a blog devoted to Kew Gardens and it looks to me like it is well worth visiting and bookmarking. It goes by the ominous acronym, "KGB". I'm adding it to this web site's lists of external links. Click on thumbnail to open WLIW page. Click here to read the WLIW program description. I just visited the Kew History website. I was born in the Alt Green Towers, 1942. I will look for peopleless photo of it at that time. My next visit to my mother's should be in late June. I loved the web site. I learned a lot and the 1940s photos brought back such memories. The old and present photos of 118 St and Metro Ave brought back a lot of memories because my grandmother lived in the apt bldg on 118 St just south of what was a nursery school in the 1940s, probably one of the orig private homes that you show on the website. Remember Rosenberg's Candy Store, the two bowling alleys, Gulker's Pharmacy, Sani Cleaners / Arthur Berger Cleaners, the horse-drawn milk wagons during WW II, the trolley car on Metro Ave.? Editor's Note: Click on the following links for information about upcoming local events from the Kew Gardens Council on Recreation & the Arts. Click on thumbnail to open Facebook page. I would like say thank you to Joe De May for the incrediable job he has done, and continues to do with the Picture History of Kew Gardens. It is truly a labor of love, and very much appreciated. It was around before Facebook, and it was a huge help re-connecting a lot of us. Thank you, Joe! Click on thumbnail to view enlargements. Editor's Note: Many thanks to Jeff Spolan for 5 more 1964 images of the Richmond Hill High School spring play. We can also both be found on Facebook.com so join us there as well and reconnect. As of this posting the Committee has located over 1500 alumni from the 3 classes. Hi....our next show featuring the "Kew Gardens Musicians" will take place at the Austin's Steak and Ale House (82-72 Austin St.) on Wednesday, April 1st. It will run from approx. 7:30 to 11 P.M.
Click on thumbnail to view more information. Is it possible to post this flyer for an Eye Care Fair that will be held at the Kew Gardens Community Center? I'd like to write a few words about the man. His name was Tom Bow. He lived at 118-09 83rd Avenue in apartment 2C . I can attest to this because he was my next door neighbor. And as was the custom, every Chinese New Year he would present his landlord - without fail - a small gift. - Usually it was something like dried Lychee nuts... - and I can't remember how it started- but when I came into his store he would greet me with the words : "You drink milk?" and then give me a big smile and laugh and then I'd laugh and that was because over many years he'd watched me grow up. The joke between us was - of course - milk made me grow "big and strong." I liked him a lot. I suppose you are right about your description of his general behavior to mostly everyone else...he pretty much kept to himself and was not particularly fluent in English. One night men came into his store and demanded that his laundry businesswould be better served if he'd let them take his laundry and have it done "wet wash" somewhere else in return for a cut of his business. Tom Bow resisted, and for his trouble they beat him up and broke his right arm and I do remember seeing Tom's arm in a cast .. but he wouldn't tell me what had happened... I didn't know the truth at the time - but I did eventually find out what had happened to him from an unimpeachable source. Years later Tom Bow was diagnosed as having heart trouble. When he didn't have much time left and it was suggested to him that he "take it easy" Tom Bow went off one night to Chinatown in New York and had himself a great time which included gambling and lot of liquor. His attitude was he was going to have some fun. When he passed, he left his wife behind in their small apartment. The children had all grown up, moved away and rarely came to visit her... but they paid her rent. Sometimes I 'd see Mrs Tom Bow sitting alone on the stoop in front of 118-09 83rd Avenue but there was an awkward gulf of language between us. Editor's Note: Those who do not have a Face Book account might not be able to view Larry's Kew Gardens page, so here is a PDF screen shot of it. Pictured here is the yet to be developed Briarwood/Kew Gardens Hills section of Queens, NY taken at 84th. Drive sometime in the late twenties. Editor's Note: Many thanks to Jeff Spolan for a c. 1962 image of the Russell Sage softball team, and 1964 images of the Richmond Hill High School spring play. I lived in Kew Gardens from 1956 to 1977. I have a hard one for you---this is before your time and probably most of your readers' time---BASSO's. Joe Basso and his sister ran a tiny grocery on Metropolitan Avenue. I can still "smell" it - fruit galore, cold cuts, soda, Larson's baked goods. Joe and his sister (I cannot remember her name) lived on Metropolitan Avenue, a few blocks up from the store, and would "share" watching the store - Joe AM and sister PM or vice versa. Joe wore a tan jacket and tie when he was on duty. My parents had a "charge" account there. Joe would tally up the price of the items in pencil on a paper bag. Is anyone with me on this? Joe (or sister) would get each item for you, individually. What service!! Time machine, anyone??? I love this site. When I lived in Kew Gardens I don't think I really had any idea what a special place it was. Now I do and viewing the posts and looking at the photos evokes such touching feelings - seeing the names of the kids almost forgotten awakens beautiful nostalgia even though, as a boy in those times, the reality was not always quite so sweet -- mostly because of the difficult personal challenges my parents endured in those days. Our family (including my parents, Ruth and Ed Wertheimer, and my older brother, Jack) moved to 118-35 Metropolitan Ave in 1943 when I was four and then to 83-40 Austin St in the '50s. I went to three schools before getting to Forest Hills HS as a sophomore in 1953: PS 99 (1st - 5th grades), PS 90 (6th grade) and JHS 73 (7th - 9th grades). My mom transferred me to PS 90 for that one year because, for some reason, I had developed a bad reputation with the principle, Mrs. Oliver, who hated me and was making my life miserable. Although it was probably a good survival move, it caused me, sadly, to lose connection with many of my PS 99 classmates. I moved out of Kew Gardens around 1957 while I was going to Brooklyn College and then eventually left New York in 1963, living in lots of places including San Francisco, the Los Angeles area, Chile, Washington, DC, Newark NJ, Berkeley CA, Flagstaff AZ, Denver CO, North Wales, PA, Kalispell Mt, Mt Shasta CA and now Ashland OR (plus some periods "on the road"). My history includes being a CPA, a Peace Corps volunteer in Chile, a Peace Corp staff person in Washington, DC, the director of an anti-poverty program in Newark, NJ, a field biologist in Arizona, a ranch hand in Montana and a financial advisor/investment manager in California and Oregon. I'm retired now and a fair amount of my energy goes towards trying to improve the lot of kids who wind up in the foster care system as the result of parental abuse or neglect. In my early adult years I was in love with a beautiful girl named, Joyce Dorchinsky (or Joyce DeSena, her stepfather's name). Although she was from another part of Queens, perhaps just by chance, someone here will recognize the name and let me know. I'd love to find out what happened to her. If you remember me, it would be great to hear from you. I found this site by internet browsing. With many thanks to my cousin Betty (Davidson) Gray for turning me on to your site. I've been reading all your messages and it's about time for memories of my growing uo in Kew Gardens. 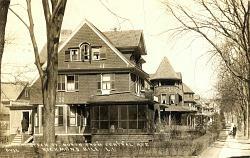 I lived in Kent Manor from my birth in 1940 until I relocated to California in 1970. I graduated from P.S. 99 in 1953, the last 8th grade graduation. Leaving with us were the upper grade teachers Misses Smith, Goldberg, Oshman and Seaberry. Our principal, Mrs. Olliver. had assembled an outstanding faculty. I was in the last freshman class at FHHS which consisted of the P.S. 99 graduates living on the north side of Metropolitan Ave.
My mother, Ruth Davidson, was a kindergarten teacher at P.S. 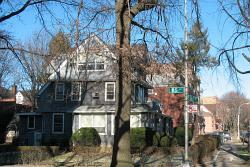 144 in Forest Hills for many years and, after retirement, became active in NCJW and the Council House on Lefferts Blvd. My dad, Will Davidson, who played in the Queens Symphony Orchestra, was the Packmaster of Pack 39 during the early 1950s. He had been an air raid warden during WWII and I remember him going out during air-raid drills to turn off the street lights and check for home lights not blacked out. We recycled tin cans to a big drum near the booth. Only a few old friends and neighbors encountered since moving to Calif., including Larry Oppenheimer, Billy Josephs, the Babcocks (Gordon, Lisa, Audrey & Peter) and Peter Heller who had kept up his friendship with my brother Richard until my brother's passing four years ago. Peter had a memoir of life in Kew Gardens published in LA Magazine which included the Big Rock and the Austin Theatre's annual Easter egg hunt which he won the first prize one year. With so many childhood memories, it's hard to know where to begin, but first I must thank so many of you who posted in the guestbook for jogging my memory. 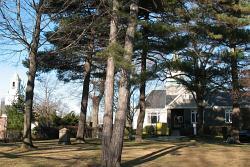 Living in Kent Manor, I spent a lot of time in the woods across the street. I still remember the pale green of trees coming into leaf in Spring and the Fall colors. There was also the flowering dogwoods, Jack-in-the-pulpit and all that poison ivy. There were also "foxholes" from trees uprooted from the hurricane of 1938. I remember the 26" snowfall (Blizzard of '46) and the snow fort on Park Lane S. opposite Abingdon Rd. Later there was digging out of parking spaces after snow plows piled snow against the doors and trying to repark after the slush turned to ice. There was the LIRR crash in 1952 with 77 killed. Our neighbor with the fire department got an early call and with my dad, we drove to Brevort St. as the first responders arrived. I also remember the steam locomotives on the LIRR whose white steam would reappear after passing under bridges. I saw FDR in his motorcade on Metropolitan Ave. as he traveled between '44 campaign rallies at Ebbets Field and the King Mansion in Jamaica. Beba Lyons saw Harry Truman as he took his morning walk in the big park. He was staying with UN Secretary General Trigvie Lie prior to his speech to the General Assembly in Flushing Meadows. I saw VP Nixon giving the trophy at the Tennis Nationals at Forest Hills Stadium (later a venue for the Beatles). LBJ was at a Queensboro Hall rally in 1960 and pictured eating a knish at the Turnpike Delicatessen. Opposite the Hall was Luigi's, our place for pizza long before Dani's. I remember the Saturday matinees at the RKO Kieths where we would see two features six cartoons, two serials wher my brother and I paid for two admissions and still have change from a buck for ice cream cones at Jahn's for the walk home. There was Rosen's candy store (now Dunkin Donuts) with 2ct pretzel logs and 7ct ice cream cones. They had a rack of comic books which we would browse and sold out the first issue of Mad Magazine which was disguised as a composition book. Thanks to the correspondent who remembered the ragman's refrain, BUY OLD CLOTHES. There were horse-drawn milk wagons during the war, azaleas and flowering cherries in spring, bowling lanes on Metropolitan (with 25 ct beers for beer frames), the Good Humor truck near the Big Park, and stickball in the P.S. 99 schoolyard with the coal chute doors as home plate. This message is for Linda Zbar looking for people from 118-41 Metropolitan Avenue. My ex-husband, Michael Franklin lived in the building on the first floor. I believe you are searching for Jerry Weber's sister Geraldine? Jerry was a police officer but is probably retired now and I'm not sure where he is living. Perhaps having his sister's maiden name will be helpful. 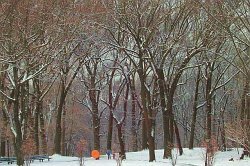 Editor's Note: Click on the image above to view a winter slideshow of Forest Park on the Kew Gardens Civic Association web site. Here's a photo of Metropolitan Ave in the 60's! It is with great sadness that I report the passing of my father, Morris (Moe) Goldberg, who died on January 9th at the age of 97. Dad lived in Kew from 1935 until 1975, and was married to my mother, Rosalind (Roz) Goldberg until her death in 1966. My brother Jonathan and I will miss him very much. It has been a few years since I have posted anything in the Old Kew Gardens guestbook, but after viewing the pictures of Jeff Saul, Danny Lehrman, Gary Shultz and Roger Sabo, I decided that it was time. All four of them were in my class at PS 99. It was fun seeing them now and hope that I have aged as well. I am still very close to my oldest friend, Anita (Frey) Landau, and am related by marriage to Jay Kaltman. Although most of FHHS is a blur, I remember PS 99 very well. Although I spend a good deal of my time in Great Barrington, MA, we still have an apartment in Manhattan; and every once in a while, I drag my husband out to Kew Gardens to drive past our house on 80th Rd. Nothing much has really changed, and it appears that it is still a very unique place. My brother Richard, and sister Louise have equally good memories, and we all wish our kids wouldn't laugh when we talk about growing up. My fondest regards to all of you that entered PS 99 in 1947!!!!!!!!! In response to Jacques Werth's posting of January 7th, I'm not sure of the story of William Auer, however, I do recall hearing about him from my maternal grandfather, Harry Silberman, who owned Siltro's Luncheonette on Metropolitan Avenue. Although the store changed hands before I was born, my childhood was filled with stories from those years. In fact, my mother and father met working behind the counter of Siltros, so they must have known Mr. Werth as well. I enclose a photo of my grandparents, Harry and Anna Silberman, in the luncheonette, ca. 1955. Please feel free to publish this note in the guestbook and give Mr. Werth my contact information should he care to get in touch. It was by chance that I discovered your website last night. What a fine tribute to Kew Gardens. It brought back lots of memories. I can't tell you how much I smiled when I opened up the PS 99 photo section to Class of 1962 Kindergarten 3 and found many familiar faces, including my own PS99-1962-kindergarten3.html. I believe the girl in the first row, far right, might be Gail Star (spelling?). My family moved away from Kew Gardens when I was in the third grade, and it was Gail Star, with dazzling but sad blue eyes, who came up to present a card from all the day I left. I don't think I even liked girls then, but I was touched. Now that I'm 3,000 miles away ('m currently working in Paris, after living in Rome, Milan, Brussels and New York City), thank you for bringing me back to my old neighborhood again for a few moments, where my biggest concern used to be if I had enough pocket change to buy something at Gussie's Candy Store on 84th Road. Found this website while surfing-so exciting! I lived in the apts at 8374 Talbot Street. I attended PS99 through 2nd grade. I have such fond memories of the neighborhood. The milk man bringing cold milk up to the apt and leaving the bottles in a crate and always hearing the clink of the bottles. Later my mother would skim the cream and place everything in the ice box. Yes, I remember the ice man coming also. The hallways were marble-floored, as were the entire lobby and stairs. I can remember taking the elevator downstairs, carrying my roller skates and key and sitting on the steps in the lobby putting them on over my Buster Brown shoes. I believe we lived on the 13th floor and my mother would watch us leave the building from our fire escape. We would skate from the front of the building around to the side and back-over and over again. Usually, an unexpected fall, resulting in a scraped knee or elbow would bring us within view of the fire escape with enough crying to get immediate attention from neighbors from the 1st floor up. A dab of mercurochrome and a bandaid would cure all wounds and the skating would resume. One day a week, the breadman would show up in the front of the apt and we would get a loaf of Peter Wheat Bread and crumb cake. That was such a treat. The knife sharpener man would come periodically and park his wagon, pulled by a horse, in the front of the building. He would turn on the sharpening wheel and the housewives would come down with their cutlery to be sharpened. Gosh, I didn't realize I could go on and on....don't want to bore you, just thought I would like to share some memories of a neighborhood of the past. Do you have any pics of this particular building? There was a fire hydrant in the front also which was opened for the children in the Summer. 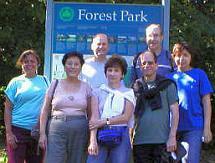 This great website that you have developed has rekindled old friendships throughout the country. I recently connected with long-time friend Mike Whelan - who lived on 118th St. I spoke to him on the telephone and he said he was in TRANSYLVANIA or maybe he said PENNSYLVANIA - well I guess that's the second thing that goes. Mike went to RHHS and was on the swimming team (WANNA BEE - Olympian - he drank more like a fish than he swam like one. Mike was also a member of the Hoffman Junior Bowling Club and was able to provide two more of the names of our members. KURT ROSSNER - 2nd row - 4th person from the Right to the Left and STEVE SMITH, standing third row 5th person Right to Left. For those of us that remembered JAHN's Ice Cream Parlor - and I was sorry to hear of its closing, he was the Extraordinaire WAITER for many years. Jahn's was a great place to hang out after the movies at the RKO Keiths or coming back from the Hillside Roller Drome - on weekends the lines seemed to have gone around the block just to get in and be seated, but was well worth the wait. Many of us had probably carved our initials in the tables and the back of the seats in the booths. He got me a job as a BUS BOY which lasted about a week - I thought the waiters were to share the tips with bus boys - oh well. If they had ratings of food establishments back then - JAHN's would have gotten an "RH" Factor. I reminded him of the incident when one of the patrons - had wanted me to get her waiter because there was a little Extra NOT Terrestrial 6-8 legged passenger on the top of her Sundae. I immediately summoned Mike - and she asked him if that was a little extra that came with the dessert. Mike as KOOL as he was - went to the back - flicked off the Hitch Hiker that probably came down from the ceiling - resprayed whip cream and added a new cherry. Mike said that was the only incident of it's kind and it had become LEGend. The "RH" rating could have meant Richmond Hill or maybe R oac H.
The other incident that vividly stood in my memory, was that diagonally across the street was GLENN's - the neighborhood Bar. One summer night along with the SCHAEFFER Bros - Twins Bruce and George and Bill Schneider - after probably consuming a few SINGapore Slings we decided to get something to eat at JAHN's and eventually ordered the KITCHEN SINK - it was for 8-12 persons - 52 balls of ice cream, bananas, nuts, cherries, whip cream, even probably a couple of FAUCETS. After stirring and mixing this concoction into a uni-colored liquid and after a lengthy period of time we were able to devour the whole thing. As I got older I have become LACTOSE -( not Lacking Toes) Intolerant - just like Oil & Water don't mix - Alcohol and Milk Products don't do too well. I finally realized why GOD created ELBOWS - maybe for the macaroni and cheese, or plumbing parts, but they sure made a great support while your hands were wrapped around the commode. PS - BIG FOOT and The New Feet on the Street have been identified in the Los Angeles area. Hi Joe .... Our next show "The Kew Gardens Musicians" will perform on Wednesday, January 28th, at Austin's Steak and Ale House from approx. 7 to 10:30 P.M.
My family moved to Kew Gardens from Brooklyn when I was eight years old. That was in 1944. We first lived at 118-35 Metropolitan Ave. When I was twelve we moved to Austin Street just south of Lefferts Blvd. Around the corner from the movie theater. Of course, I want to PS 99 and then to Forest Hills HS; graduating in 1953. This week I wrote an article about a man named William Auer who lived at the corner of Grosvenor Rd. and Park Lane South. In the early fifties, he was said to be one of the wealthiest people in Queens. 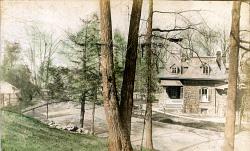 I remember his house as one of the largest and most beautiful in the area; he went about in a chauffeured limo. I knew him because I worked as a soda-jerk and short-order cook at Siltro's luncheonette on Metropolitan east of 83rd Avenue after school and weekends. I made breakfast for him every Sunday morning that he was in town. I believe that he was the chairman of a New York bank. I would like to get this information verified prior to having the article published. If any of your readers or other contact have any knowledge of him, I would appreciate hearing from them. Jacques Werth - previously "Wertheimer" - nickname "Jack"
I lived in Kew Gardens from 1954 (I was 3) until 1969, when I went away to college... My mom, who is now 87, still lives in the same apartment on 118th Street. It's that time again to open a new page in the Guest Book with the hope that this New Year will bring much joy, health and happiness to all of our friends and neighbors. And, Joe; just a special thanks to you for all the hard work you do to bring back our memories of Old Kew Gardens so vividly. Back | July - Dec.